1. Brush a coat of Country Blue Heavenly Hues on the wings of the candleholder angel and the bottom portion of the angel box. Wipe off with a damp sponge. 2. 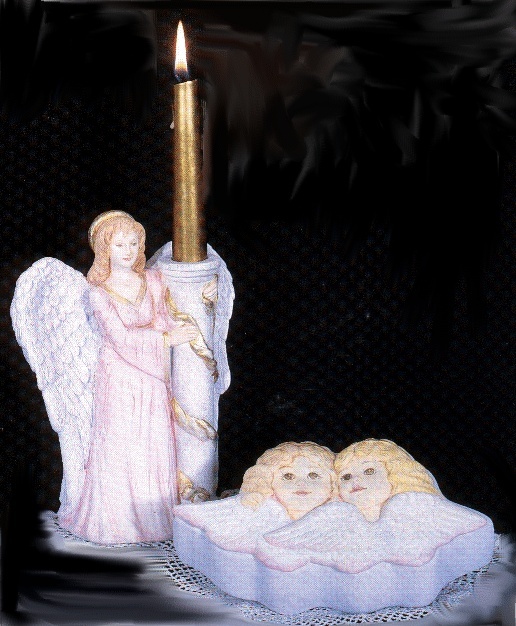 Brush a coat of Heavenly Grey on the candleholder angels' pillar and wipe off. 3. Brush a coat of Shadow Tan on all the angels' hair, wipe off, then brush on a coat of Golden Halo and wipe off. 4. Brush a coat of Angel Flesh on all flesh areas: wipe off. 5. Outline and fill in facial features with Earth Brown and Soft Black. Rouge in cheeks with Misty Mauve Heavenly Hues. 6. Brush a coat of Misty Mauve over angels' wings on angel box and wipe off. 7. Using Heavenly Gold, paint halo, line edge of candleholder angels' gown and brush decoration on pillar. 8. Spray pieces with Matte Spray Sealer. Brush a coat of Starlight Crystal on halo of candleholder angel and on wings of all angels. DecoArt offers you the widest range of choices for all your Crafting, Tole Painting, Fabric Painting and Decorating projects. We are well known for our artist quality pigmentation, outstanding coverage, and consistency of color. We listen to our customer's input, and feel that by combining our technology with their experience, we are able to produce superior paints that will fill any of your creative needs. Heavenly Hues are transparent color washes that allow almost instant, one-step decorating. To achieve a soft, transparent watercolor-look on ceramic bisque, plaster or wood, simply brush these washes on, then wipe off with a sponge or cloth. Heavenly Hues can be used over opaque Americana Acrylics to create an added depth of color as well as an antique look. DecoArt products are available at your local arts and crafts outlet or check out website for Internet and mail order suppliers.